Provide comfort for the family of Frederick Idzi with a meaningful gesture of sympathy. It is with profound sadness the family of Frederick M. Idzi (Ellis) announce his passing on January 14th, 2019. Born Frederick M. Ellis on October 29, 1954 in Saint John, New Brunswick to Louise Ellis. As a young man, Fred served for several years in the Canadian Armed Forces (infantry), as well as the Canadian Coast Guard (CCGS Walter E. Foster). 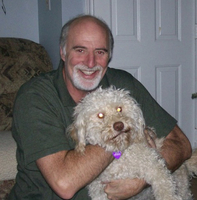 Earning a Masters Degree in psychology from the University of New Brunswick, he went on to use that knowledge to help others. Whether it was at the Saint John Learning Exchange or Community Living in Halton Ontario, Fred always went out of his way to ensure others were taken care of. Fred was a funny, witty, kind-hearted man and above all else he loved his family (and Yogi), always making that known by his actions and words. His strength, determination, love and joy will live on in us forever. We are all truly better people to have had Fred in our lives. Fred is survived by his loving wife Sandie, his only son Luke Ellis, grandchildren Aidan and Anabelle Ellis, step daughter Nicole, step sons Timothy and Bradley, sister Carol Brewer and many nieces and nephews. The family would like to express their thankfulness and love to all who cared for and assisted in Fred’s care. Special thanks to Alex and Sandra and St. Joseph’s Hospice for their excellent care in ensuring everything was as it should be. Family and friends of Fred continue to celebrate Fred’s Life. A life of loving, giving and caring. A formal service or funeral procession will not take place at Fred’s request. The family ask that donations in memory of Fred be made to St. Joseph's Hospice of Sarnia-Lambton. Provide comfort for the family of Frederick Michael Idzi (Ellis) by sending flowers. Our hearts are saddened with the passing of Fred, our brother-in-law + uncle. Fred had the most beautiful smile, loved to joke + gave the biggest hugs. Our thoughts + prayers go out to my sister Sandie + family, and to Luke + family. RIP Fred, pain free. Love Debbie, Sach, Matt + Kyle Gray. So sorry to hear of Freddy passing .Glad we got a chance to reunite with him again after such a long time in New Brunswick. He was a big man with a huge heart and a great smile.We will miss him!